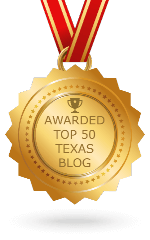 I started planning our annual Memorial Day weekend road trip to the Texas Hill Country months before, but as often things occur, it did not turn out as planned. Gloria was able to take Memorial Day off instead of having to work the holiday like previous years, so that gave us three days to enjoy the wine scene. 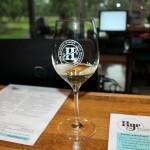 This year we wanted to eat dinner again at Bryans on 290, and we invited a number of wine friends to join us. The list of interested people was growing and we were going to have a good crowd and Bryan Gillenwater was willing to accommodate us. Some appointments were made for the weekend too. Then two weeks before Memorial Day weekend, Gloria’s daughter got a job in Fort Lauderdale, Florida, and she decided to drive there with most of her belongings Memorial Day weekend. Well, family comes first and Gloria wanted to make sure she arrived safely. That left me taking our road trip alone, and I tried to make the best of it. I left home early Saturday morning and headed toward Comfort, Texas. 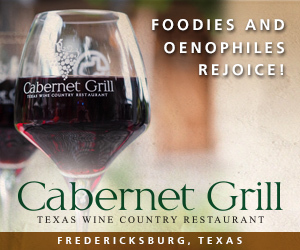 Whenever we make trips to the Hill Country, unless it is visiting new wineries that have recently opened, we spend time revisiting other wineries. 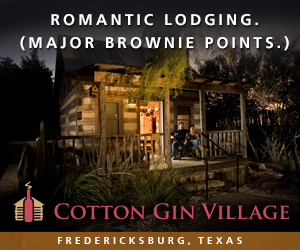 As you know, there are a LOT of wineries in the Hill Country now, so trying to spread the “love” around to different wineries takes time, especially when you have only a weekend to do so. In Comfort, I first stopped at Newsom Vineyards at Comfort because they open at 10:00 a.m. They had put in a nice parking lot in the front since I had been there last, and Nolan Newsom greeted me at the front door. 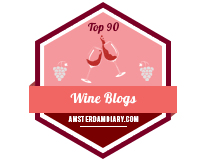 When I visit wineries again, sometimes I simply ask, “What’s new?” in wines instead of doing a full tasting again. If there are some new wines I haven’t tried before, I may end up just getting a glass of that wine, and that is what I did at Newsom’s with a glass of Albariño. Nolan and I were rocking with his background music when his wife, Yanmei, joined us. If you were not aware, Yanmei is a winemaker at Driftwood Estate Winery and it is always a pleasure seeing Mei. The next winery I intended on visiting was about to open at 11:00 a.m., so I said my goodbyes and headed to Bending Branch Winery. There is a tasting room on High Street right in Comfort, but I opted to visit the winery itself. In the winery’s tasting room, I decided to do a tasting this time and at the start of my tasting, owner Dr. Robert Young stopped in briefly to say hello and to have me taste a couple things that were not on the tasting menu. One of those wines was Bending Branch’s first estate Souzão. I always have trouble trying to remember the correct pronunciation of the grape and Dr. Bob said he pronounces it as Sue-Shou. This is like sous chef (soo-shef), but with “ow” at the end as if you hurt yourself. I’m not sure if that helps you, but it will help me to remember it. Regardless, the wine was excellent and a bottle came home with me. The rest of the tasting was also great. 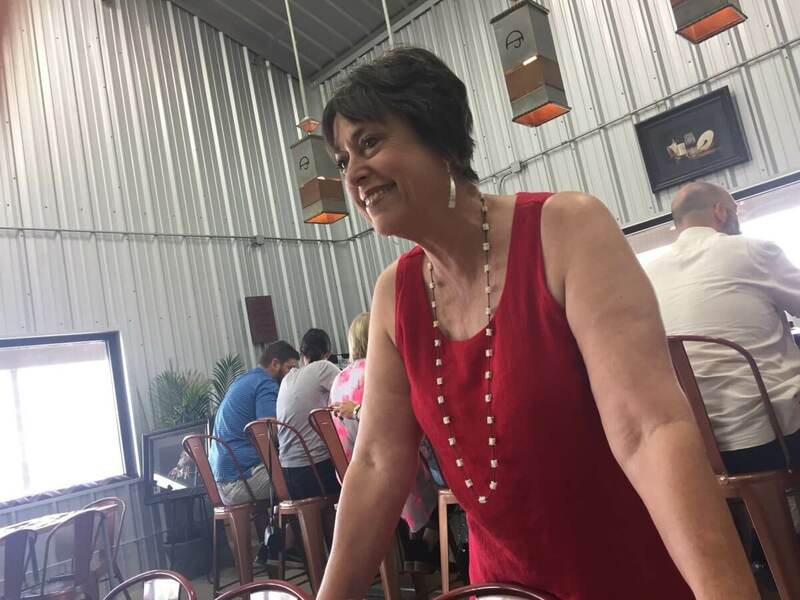 It was time to head to Fredericksburg and along the way, I needed to stop at 1851 Vineyards to take a photo and meet my friend Karen Sportsman. 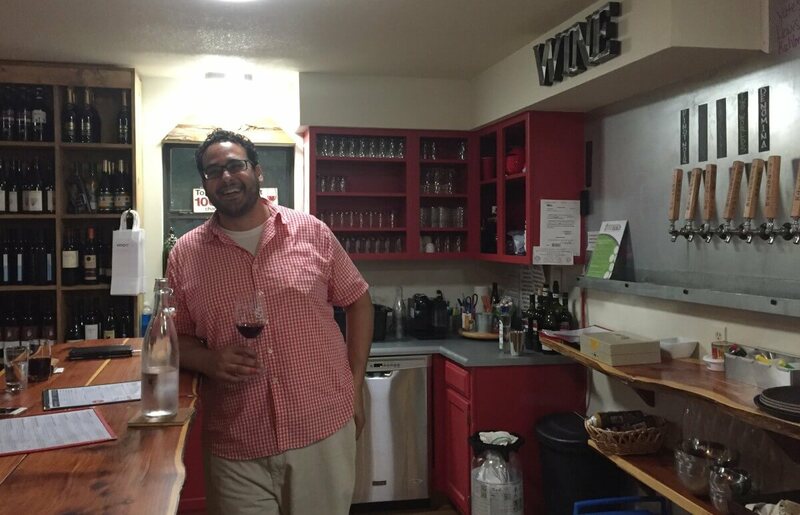 As soon as I walked into the tasting room, I heard a laugh from the other side of the room and there was my old friend Vinny Lupo. I did not realize it, but he said he is helping out at the winery on Saturdays. Most of the Hollimon family, owners of 1851 Vineyards, was there working in different capacities. Matriarch Dabs Hollimon handled Karen’s and my tastings and I got to meet her son Jordan for the first time. We had some of the wines before and the new ones were also, of course, very good behind the talent of winemaker John Rivenburgh. 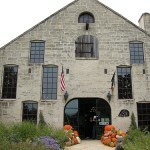 I had to say goodbye to Karen and everybody at the winery and go to my next destination which was Lost Draw Cellars. 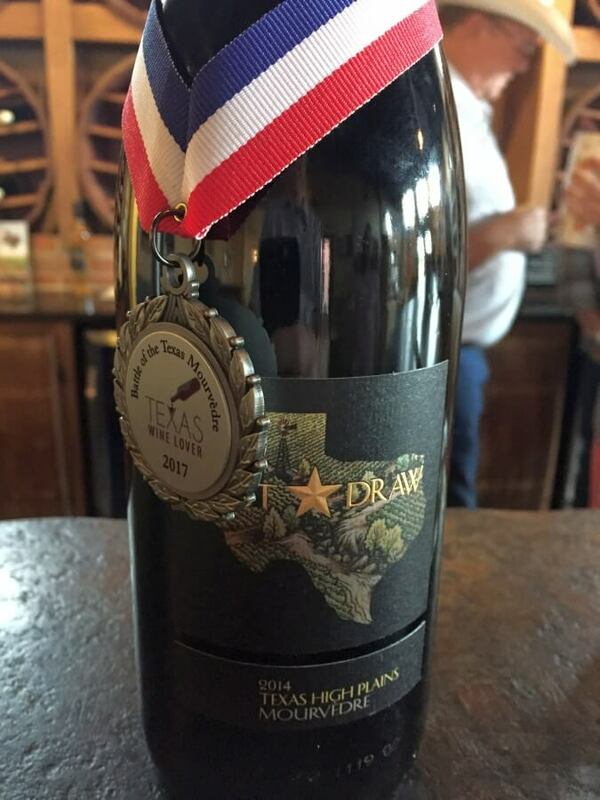 Besides tasting any new wines, my other motive was to deliver the silver medal for the Lost Draw Cellars Mourvèdre from the recent Battle of the Texas Mourvèdre. Co-owner Andrew Sides was present and gladly received the medal, and the staff had a bottle readily available to place the medal. After a glass of wine, I was asked if I wanted to try a new dessert wine. I didn’t have to be asked twice, and had the chance to taste Cheval which is not on the tasting menu, but is available for purchase by the bottle. There were only 64 cases produced, but I can vouch that it is a very good wine. 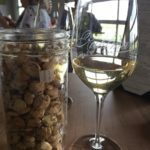 I was staying in Johnson City for the weekend, so I started going east and to my next planned winery. 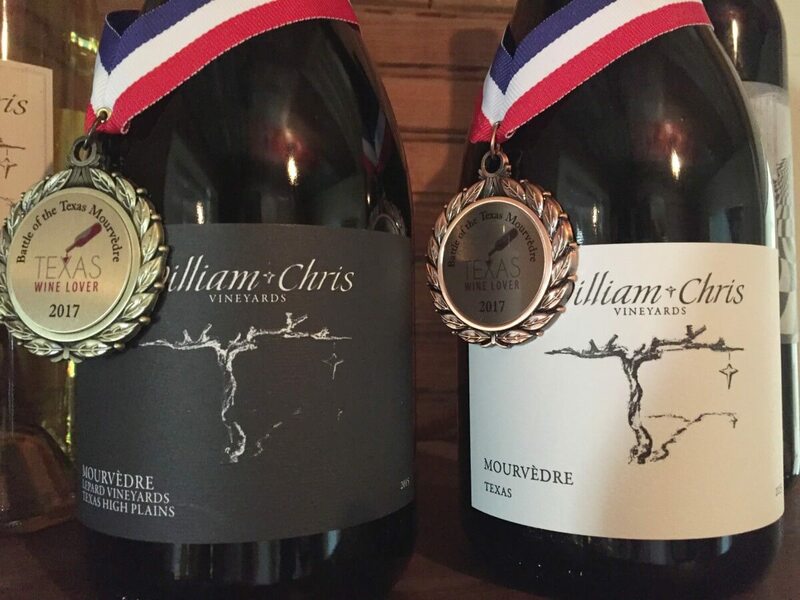 Along the way though, I stopped at William Chris Vineyards for the remaining two medals from the Battle of the Texas Mourvèdre. William Chris had a gold and bronze medal coming and I presented them to the staff. Anthony Harvell, Director of Retail Operations, wanted me to try a wine in the winery, so we headed to the production building with a glass in hand. Their top wine from the Battle was the Mourvèdre 2015, Lepard Vineyards (oak fermented). In the winery was a table with surprisingly some Mourvèdre on it. William Chris has been experimenting with fermentation in a clay pot instead of a barrel or tank, and the same wine that won the Battle was also done with fermentation in a clay pot. Anthony gave me a taste of that version and the oak fermented version, and as he said, it was definitely unique. Same grapes, vineyard, and vintage, but fermented differently really does make a difference. After a couple more samples of wine being made, we went back to the tasting room. The medals had been placed on the two winning wines, looked great, and my duty of delivering all three medals from the Battle was now complete. My next winery stop was at Hawk’s Shadow Winery. 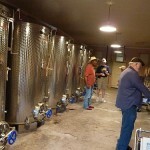 It had been a while since I visited the winery since its completion and this was another of those “What’s new?” visits. It is always nice seeing the owners and all were there pouring their wines while happy customers took in the amazing view. 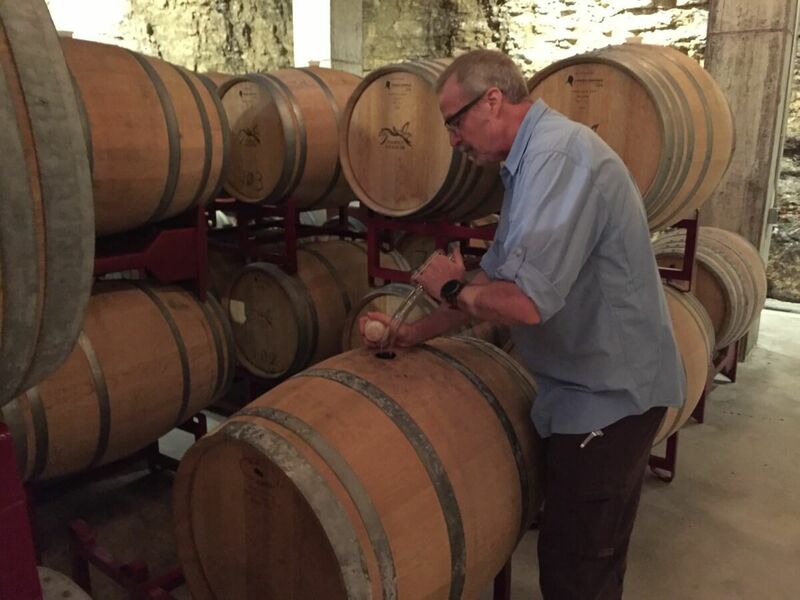 After tasting a few wines, I had the chance to try some wine from the barrels downstairs in the barrel room. I cannot recall if I had been downstairs in the barrel room after it was complete with barrels and dining table, but it was fun doing some more barrel tasting. Look for some exciting wines coming from Hawk’s Shadow. I had to check into my hotel before dinner, so I said goodbye to the folks at Hawk’s Shadow and went back to Johnson City to my hotel, and then on to dinner. A lot of people were already waiting at Bryans on 290, and it turned out we had a group of 22 people enjoying dinner and wine in the back room of the restaurant. 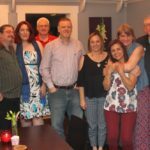 After an enjoyable dinner, some of us were not ready to end the evening, so Laurie and Shelly Ware, Rachael Theberge, and I went to a local bar where Rachael often does karaoke. Never to turn down a fun time, I had to join in too and Rachael even got Laurie up on stage to sing, and I have video to prove it. I am saving that one for a later time. Haha. Sunday came and one of the earlier opening wineries on Sundays is Lewis Wines, so I made my way to the nearby winery. After walking up the winery’s ramp to the tasting room, I turned the corner and sitting there were friends Kelli and Dave Potter. They were also in town and had the same thought I did. I joined them in a tasting and it was nice catching up. Unfortunately, I had to leave for an appointment and made my trek to Mason. After stopping in Sandstone Cellars to say hello, I went around the corner to meet with Dan and Jeanie McLaughlin of Robert Clay Vineyards. Besides producing phenomenal grapes from their vineyard, they have also started making their own wine with the plans of opening a winery in the future. They are making wines of course using grapes from their own vineyard such as Touriga Nacional, Syrah, and Ruby Cabernet. 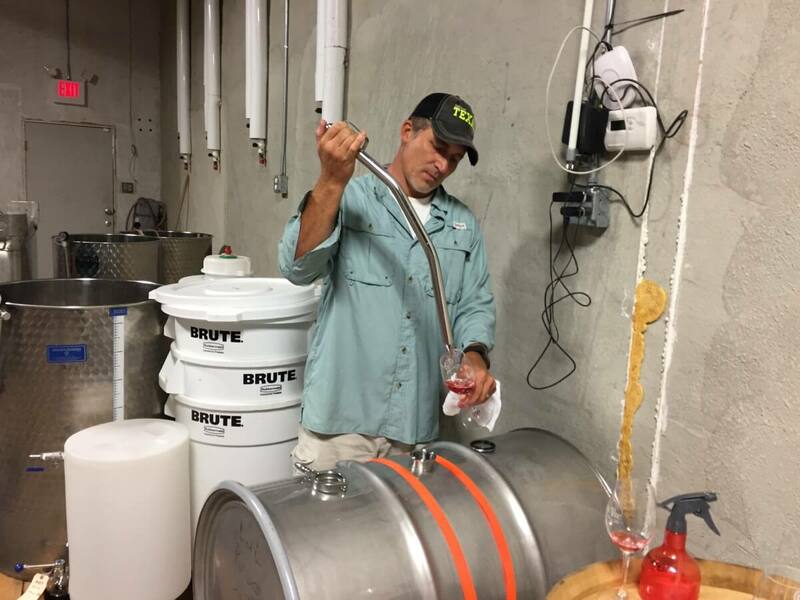 Dan is learning to make the wine, and right now they have the patience while the wine ages in barrels and tanks. We tasted a number of wines that Dan has made. Also making wine in the same vein is Robert Parr from Parr Vineyards. 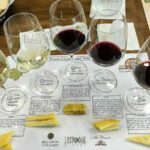 I had the chance to taste some of their wines aging too. All I have to simply say is, look out for Mason County in the coming years when it becomes the next destination outside of Fredericksburg. Like always, it’s great seeing Dan and Jeanie. 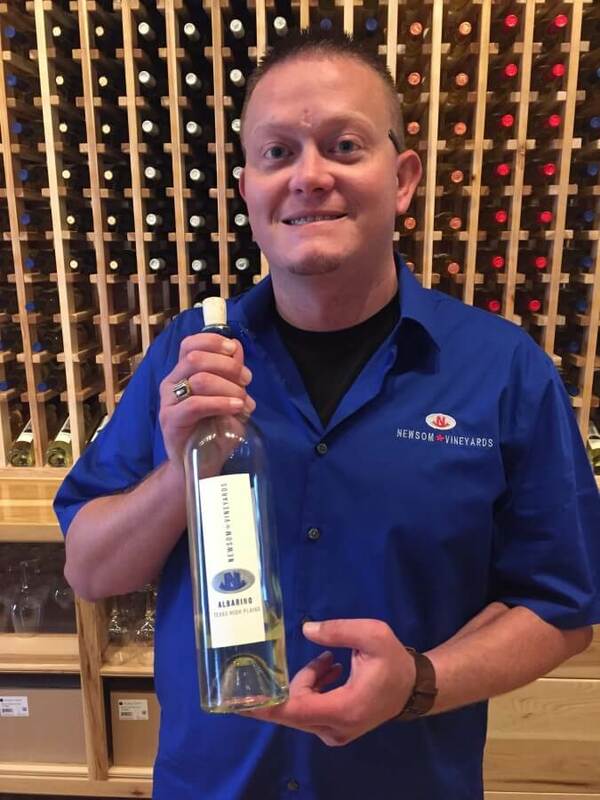 I had planned on visiting Perissos Vineyard and Winery on Monday during my way home, but I realized that since it had not been a short drive to Mason and Perissos is also outside of the Fredericksburg area, perhaps it might be easier to visit at that time. After looking it up on the map, it actually would save a little time, so I went to Perissos. The new production building is looking great and there was a good crowd at Perissos. 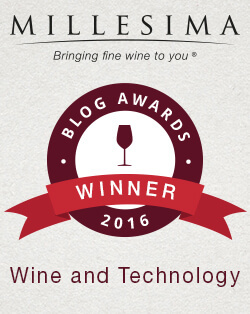 Obviously, people are discovering the excellent wines made by Perissos. Continuing my big loop, I headed back to Johnson City and dropped off my wine purchases at the hotel. Next up was to see the new tasting room at Ron Yates. 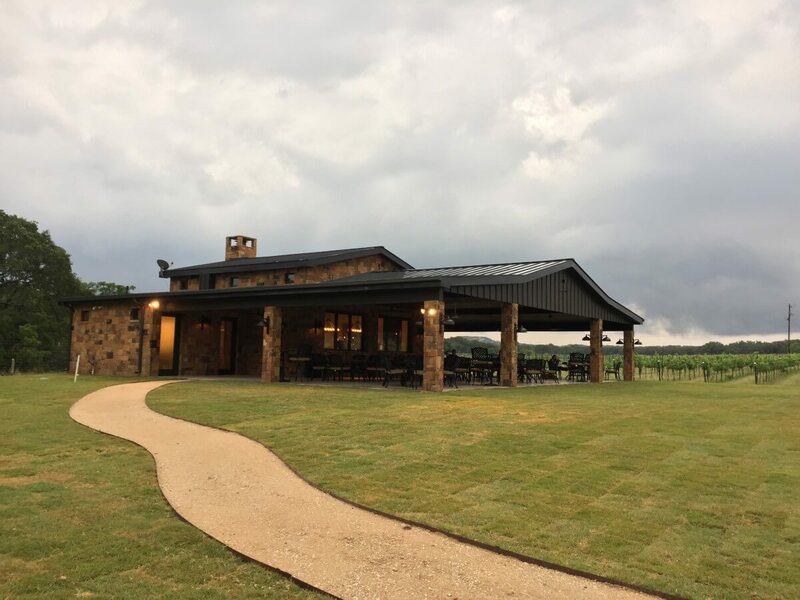 It had started raining a little, but the tasting room was beautiful and it had a very large covered patio where people could enjoy their wines. I know the staff at Ron Yates by now, and it was nice seeing them. I also had a pleasant surprise seeing co-owners Glena and Ronnie Yates. Glena and Ronnie invited me to join them at their table, and I enjoyed a refreshing glass of Sauvignon Blanc while talking to them and watching the rain fall. The tasting room had just opened the previous week so there was still a little work to do, but it already is a must stop and the winery is now open daily. Since wineries close early on Sundays, I had to say goodbye and visit Compass Rose Cellars because I had to deliver something to owner Mark Watson. The winery seems like it is often changing the way things are with tasting bars, the tasting room, and so forth. I was first greeted by a new welcome station as you arrive, and Mark’s wife Taylor was the greeter. There are now multiple tasting bars which is a good thing, and the tasting room is for wine club members only. I delivered what I had to Mark and then went to one of the tasting bars to do a quick tasting. The sun had started to go down, but it is always nice tasting while enjoying the view. I said goodbye to everybody and then headed back to Johnson City. I noticed it was not yet 7 p.m. which is when Vinovium closes, so I made a quick turn into the winery. I was hoping Daniel Kelada was there and as I walked into the tasting room, I heard a big laugh from Daniel himself. He said he saw the Jeep pulling up and it had to be me. I had a glass of wine while talking to Daniel and then it was time to get to Johnson City to meet Laurie and Shelly Ware for dinner at Pecan Street Brewing. They were waiting for me at the brewery and of course, I had to get some beer for dinner. But what surprised me was the food was excellent! I was expecting typical bar food, but the brewery really has a nice selection of food. I know where I’ll be eating next time I’m staying in Johnson City on a Sunday night. Memorial Day came and I had plans to meet Gloria’s brother Lucho and sister-in-law Patricia. 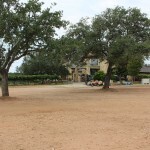 We had stayed in the same hotel, so we arranged to leave at the same time and go to Pedernales Cellars. We had hoped to do a reserve tasting since they are wine club members there, but we were told reserve tastings are only done on the weekend. We were trying to decide what to do and I mentioned that I had told someone I was going to come in to try the new wine Diva. That led to a tasting including the Diva which is a white blend including Viognier, Muscat, and Pinot Grigio. 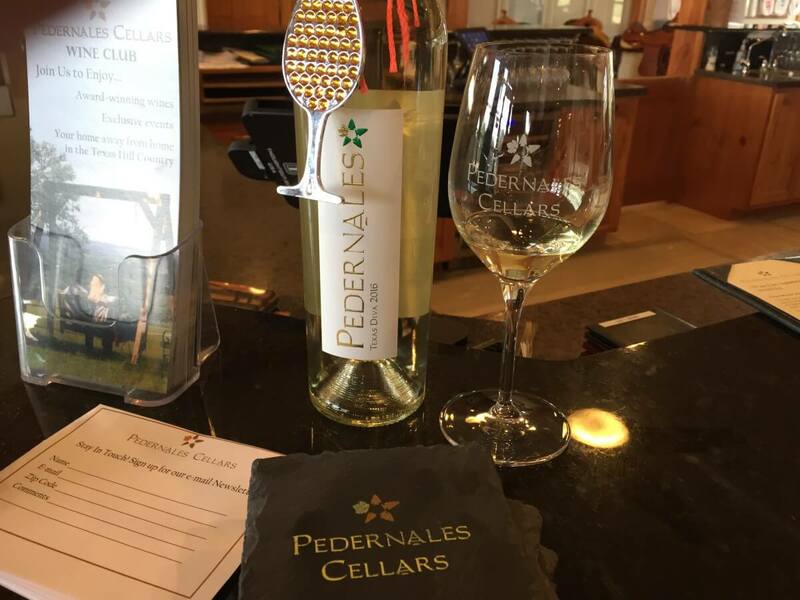 As usual, we all enjoyed our tasting at Pedernales Cellars. We were all ready to head home, but there was one winery I had wanted to visit over the weekend but did not get the chance. I asked Lucho and Patricia if they wanted to go to Becker Vineyards and try their new Texas Chardonnay. Never to turn down a wine offer, we went the short distance to Becker. At the Becker Vineyards tasting room, we were fortunate to see Nichole Bendele who handles the public relations. She led us to a spot at the tasting bar and we had a taste of the Texas Chardonnay. 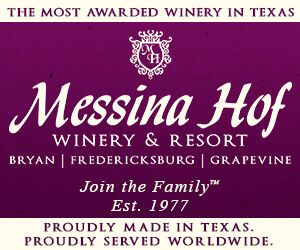 As I have learned from other wineries too, even though Chardonnay may not be the white wine of Texas, when a winery wants to make a Chardonnay from Texas fruit, it does make a very nice wine. 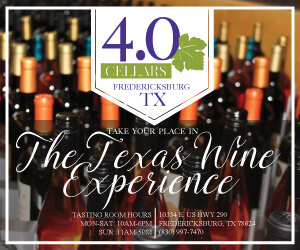 We tasted other wines noting the wines offered in the tasting room are Texas wines. While we were tasting, and since there were not many people in the tasting room, a bell rang and a guide said that if anybody wanted a free tour of the winery, he was going to be giving a short tour. We tried to decide what to do, and since I have taken a tour before when we purchased the Library Tasting tour on a Saturday, I convinced Lucho and Patricia that we needed to go. As we progressed during the tour from the tank rooms to the barrel rooms, we eventually passed through the semi-new wine club only tasting room. This was a nice tasting room wine club members can use to avoid the larger crowds that can happen on the weekends in the main tasting room. We were told one story during the tour that I had not heard before, but it made sense. Why exactly are foil capsules used on wine bottles? Apparently long ago when wine was put into bottles, the bottles were stored in dark and cool cellars for storing and aging the wine. Well, in those dark cellars were also rats who just loved enjoying a tasty snack of wood – the wine’s cork. Lead foil capsules were put on the wine bottles which served two purposes. First, they kept the corks intact and wine bottles from leaking. And second since they were made from lead, when the rats chewed on them, they would die. Now if this is true or not, it still made for an interesting story. Speaking of cellars, the tour ended in the cellar beneath the main tasting room. This is where the Library Tasting tour eventually ends up too with the long table where special Cabernets are tasted along with some light bites. I was impressed with the mini-version of the tour, and those who were fortunate to attend, got to see a little bit of Becker Vineyards that you do not normally see. It was now definitely time to go home, so I said goodbye to Lucho and Patricia, and made my way home. 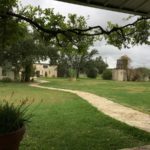 I would have had more fun during the weekend with Gloria by my side instead of going mostly solo, but how can you go wrong visiting Texas wineries and enjoying the fabulous wine? What a great weekend! You went to nearly all our favorites plus several we’re anxious to visit. Thanks for sharing your experiences! Thanks Marti. 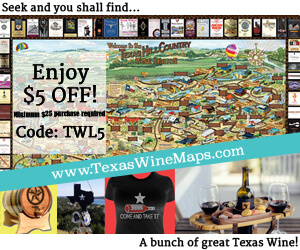 Which wineries do you still want to visit? We haven’t visited any wineries in Mason or Pontotoc yet. Hopefully, next fall. You really got my attention when you mentioned Touriga Nacional. I had heard that there were some folks in that area growing it. However, I gather that those vineyards don’t yet have tasting rooms. Compass Rose Cellars has Touriga Nacional from Mason County fruit. 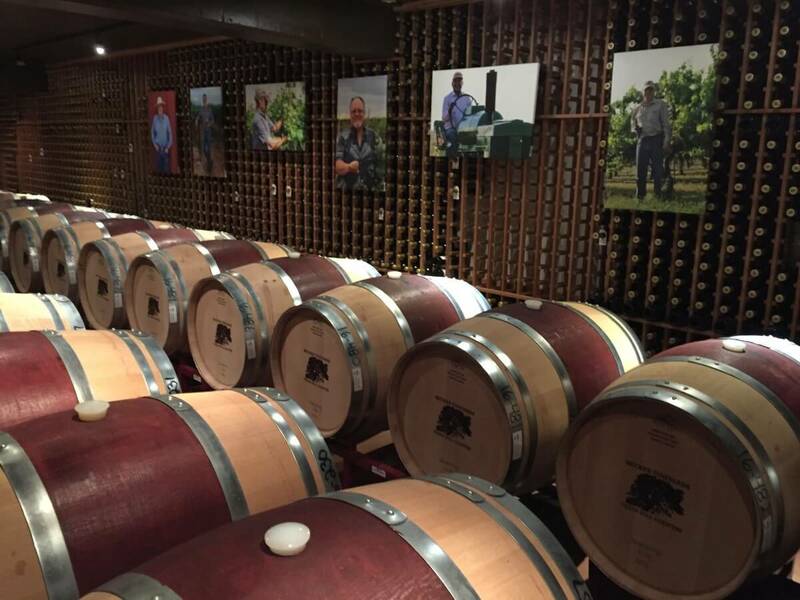 In addition, Sandstone Cellars in Mason has blends using Touriga.